Now to France, where butchers say they are under threat from so-called militant vegans, and they have asked the French government for protection. Butchers say what's at stake is not just the right to eat meat but a way of life. NPR's Eleanor Beardsley has the story. 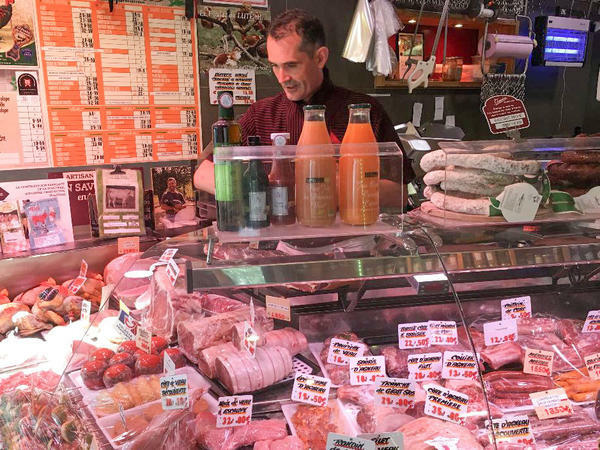 ELEANOR BEARDSLEY, BYLINE: Didier and Sandrine Tasse have run their butcher shop on this busy street in Paris for 19 years. They know all their customers and discuss growing children and family vacations. The Tasses say it's a great livelihood, but these days, the butcher and his wife are nervous about threats from militant vegans. BEARDSLEY: The couple say, "if people don't want to eat meat, that's their right, but imposing their beliefs on others isn't. Imagine working 20 years building a business," they say, "and then someone comes and damages your shop." In recent months, hard-line vegans have thrown fake blood on butcher shops and scrawled abusive graffiti. They've broken windows. Jean-Francois Guihard is president of the French Confederation of Butchers. He appealed to the interior minister to do something about the incidents in a letter last month. Guihard says the country's 18,000 small butchers are the backbone of the French economy and more. JEAN-FRANCOIS GUIHARD: (Through interpreter) In France, you go to your butcher like you go to your doctor. It's personal. And the heart of any French village or town is the baker, the butcher, the cafe. If we don't have these small businesses, the social fabric will be gone. Amazon is nice, but it isn't everything. BEARDSLEY: Brigitte Gothiere with L214, a vegan association that defends animal rights. Gothiere says her group would never perpetrate violence because that's exactly what it's campaigning against. BRIGITTE GOTHIERE: (Through interpreter) We put hidden cameras in slaughterhouses and document things like baby chicks being ground up and other cruelties. We try to show the reality of how animals live and die while being raised, transported and slaughtered. BEARDSLEY: Gothiere says while it might be tough to convince the French to give up meat, people are concerned with animal welfare. She says her organization has convinced major egg companies to stop caging their birds. And last month, thanks to one of L214's clandestine videos, a slaughterhouse was sanctioned by a court, and one employee was fired. BEARDSLEY: Back in Tasse's butcher shop, 48-year-old Didier Tasse wheels out half a cow carcass hanging on a hook from his freezer. He slices different cuts of steak from it every day. The cow is a Blonde d'Aquitaine, a breed from southwestern France. It has papers that show when and where it was born, raised, slaughtered and that list its vaccines. 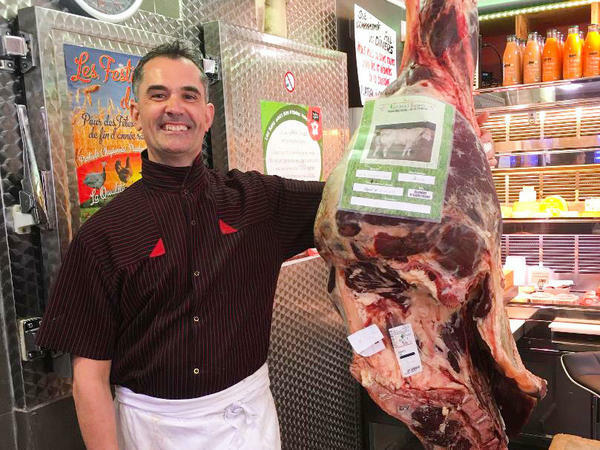 Tasse says French butchers work hard to do their best by their customers and animals. BEARDSLEY: Customer Frederique Maglione calls vegans who attack butchers terrorists. BEARDSLEY: But Maglione acknowledges problems in slaughterhouses and says that's why she buys meat only from the butcher, never the supermarket. She says mass industrial production is the problem and thinks most French people are ready to pay more for their meat and eat less of it if that means better treatment of animals. Eleanor Beardsley, NPR News, Paris. (SOUNDBITE OF TAKUYA KURODA'S "RISING SUN") Transcript provided by NPR, Copyright NPR.